You will also need at least 2 sets of pyjamas, and underwear, bras, socks, and whatever other underthings you need to have with you. * I updated many of the sold out links with this seasons similar style. This one is going to be a long one. Not long in words but with big long picture lists so I apologize if the page takes a while to load. I was going to cover everything in a few separate posts but figured it would be tedious for you to have to flip to different posts to find everything that is pertaining to this topic. After I finally figured out my capsule wardrobe for spring/summer (through that long tedious process) I began to wonder how well it would translate into packing for trips. I am not a huge, get super-fancy dressed up type of person and my wardrobe reflects that. I wanted to be able to come up with a packing list that gives me easy day options to-night options. Or as I like to think of it day/casual with the ability to dress it up and take it to-night time if the need arises. I chose a 10 day list because 7 seemed too short to test my wardrobe’s versatility, but 10 seemed to be long enough come up with 10 different day outfits that could easily be changed to-night by swapping shoes and/or accessories, a purse, and fancier hair-do. This ten-day packing list that I came up with basically gives you 20+ outfits with the ability to make more if needed and it is all completed with 20 pieces in the carry-on plus what you wear on the plane. I planned it out so the bulkier, heavier items are to be worn on the plane to make sure it all fits in the carry-on. The plane outfit consists of jeans, tank, pullover, jacket, hat, necklace, boots, watch, sunglasses, and a purse. In the carry- on are 4 tops, cardigan, blazer, 2 dresses, 2 pants, scarf, 3 necklaces, a hat, a dressier purse, and 4 pairs of shoes. Make sure to have at least one pair of dressy shoes for night wear, and if you decided to pack a hat make sure that it is one that will survive being placed in a suitcase. I learned the hard way that straw hats do not pack well. Ugh. I was having some major issues with my paths on Photoshop. They weren’t transferring through in jpg format, so I had to go back in and try to get them in there. One ended up with thick lines and one with thin somewhat broken ones. This is why I need a Photoshop course. Big Time. Oh well, I am learning as I go I guess and they turned out somewhat okay. this is awesome – quick question – when you do your ‘capsule’ wardrobes… are those the ONLY pieces in your closet? Meaning… that’s it? Or are those just 38 great things to put together to make an endless supply of outfits? Thank you for this post. It was well set out and you packed the right essentials. My bf and I are going longer than 10 days but I know with your selection I’m confident I could put a lot more outfits together. It made packing for my holiday so much easier. Thank you for the comment. Packing can be overwhelming because we all get that “what if I need this item” mentality. If you plan it out ahead of time and make sure everything goes together then you will have infinite outfit options. It is so easy to change a look just by adding a necklace or scarf, or changing shoes. Accessories don’t take much room so It’s okay to go a little overboard there if you want 😉 I hope you and your bf have an amazing time. I can’t tell you how much easier you made this for me! LOL We are planning a trip to Ireland and I knew that I wanted to avoid overpacking. Seriously, it’s a talent of mine. OCD and all that. I JUST got into watching and learning about capsule wardrobes and minimizing what I have around me. So using a capsule for travel just seems to fit. At least this trip my girls are going to be 10 so I won’t have to deal with carseats/boosters, bottles, wipes, or a stroller! It’s hard to get into the less is more mindset but once you do it changes the way you think of your wardrobe. This is coming from someone who thrived on a perpetually overflowing closet even though I wore only 1/8th of what was in there. And the ability to go someplace without lugging all the extra baby/toddler crap around is amazing. I think I sang hallelujah when my youngest was finally out of diapers 😉 It makes life a lot easier. Have a great time in Ireland! Yay! I love to hear when they come in helpful. Downsizing is so hard, but so worth it in the end. Good luck! Hi Sara, super helpful – thank you!! Can I ask where the gold sunglasses are from? The sunglasses are from H&M. They are just a basic aviator that they carry every season in a variety of colours. Here is a link to them. Thanks! Thanks Sara! Super helpful. Can you please let me know where the gold sunglasses are from? Thanks! I just want to thank you for this post! I just got back from a 2 week vacay to italy, switzerland, and germany. And was shocked I got away with just a carry on thanks to your suggestions! I literally replicated every item and it was perfect! Only thing I added was a raincoat. Thank you for making my first out of the country trip so easy and simple!! I have a couple that may give you some ideas. One for a cruise and another for Panama which would contain similar items I would pack for a cruise except I would add maybe a more formal outfit option if your cruise has dressy dinners. They are from Sam Edelman and are called the Genette sandal. They are several years old and not easy to find in stores anymore but you may be able to find a pair online by searching the name. Good Luck! 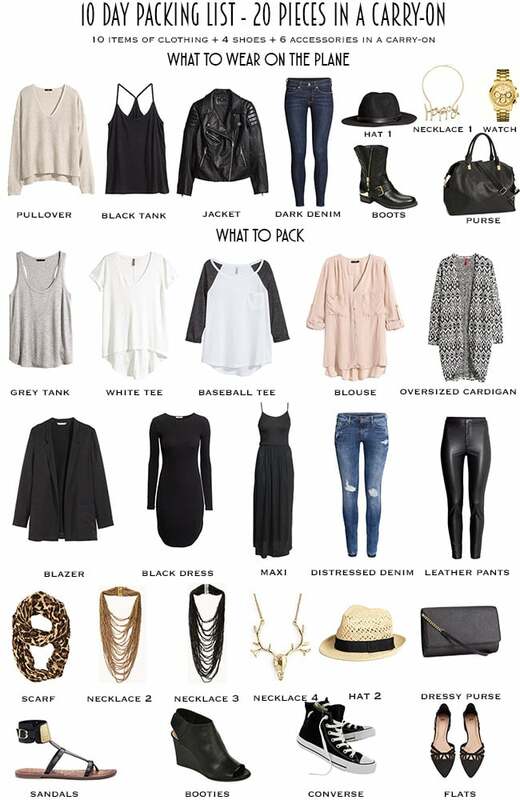 I’m heading to Toronto at the end of September and love that this list shows how to go from day to night. Looking at the weather over there in September the sandals would probably be out, are there any other tweaks you would suggest to make this list more suitable to Toronto at that time of year? It’s actually still quite hot in September here in Toronto. Even an occasional heat wave. It’s more rare for it to be cold than warm in September but like most places you can’t guarantee, so I’d keep an eye on the predicted weather until the day you leave because you most likely will want to bring sandals. The nights can cool down more (more so the second half of September) but a light jean jacket or moto jacket will be more than warm enough. If you are concerned I would stick with things you can layer so you’ll be prepared. But more often than not I wear sandals, t-shirts, and summery dresses until October. But the “graphic tee” is a band tee…. There is no “graphic tee” or band tee in this post….but since you are probably referring to another I’ll respond to your statement. I make these as a visual guides. The items names are pretty generic and for you to interpret in a way that makes sense to your personal style. You would place any graphic tee, band tee, or tee of your choice in its place when packing. I would never expect someone to own 100% off the pieces I use so they could copy every last detail into their suitcase. I personally own a lot of band tees so that makes sense for me, but a lot of people don’t like them so comparable t-shirt which some kind of graphic (for some wardrobe variation) would work for the looks I was going for.